Curry plant is a curious and interesting little herb that may not be in the top five or ten choices on your herb wish list but definitely deserves your consideration. 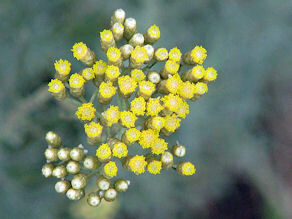 Helichrysum italicum or curry plant is a tender perennial. Outdoors, it does best in U.S. zones 8 to 11. It can't tolerate a hard frost. It prefers soil that drains well, full sun and warm conditions. It's a perfect choice for intermittent drought prone areas or for a xeriscaped (low water) garden. If you have a spot behind a shed or garage that tends to reject your efforts to plant it out, curry plant may be a good choice there, too. It performs well in poor soil and isn't finicky about niceties like pH (although keeping things on the neutral side wouldn't hurt). Because it's such a good sport about water, it doesn't require mulching. It's also a natural pest repellent. Bugs tend to avoid it, and deer hate it. 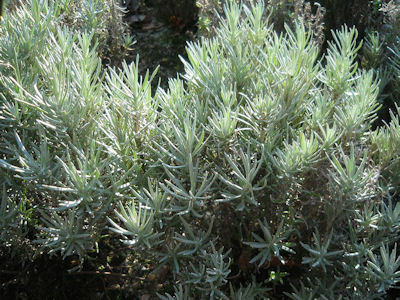 Growing to a height of about 30 inches or so, curry plant looks like a cross between lavender and rosemary. It has soft, gray-green foliage and produces small yellow flowers. It may require staking, especially in a windy location or a spot that sees a lot of foot traffic like a tree lawn. Curry plant is often promoted as an aromatic herb. Its common name derives from its scent, which can smell like curry. (As most of you know, curry is actually a blend of a variety of different spices that can vary from country to country and region to region.) When placed along a walkway, the aroma can be unexpected and enticing. To some folks, curry plant doesn't smell as much like curry as something else -- maple syrup. Regardless of how you interpret the aroma, it has a somewhat sweet, spicy and flowery note that seems at home with both sweet and savory fare. I mention this because curry plant is sometimes maligned as pretty useless in the kitchen because it has a mild flavor. Much of its aroma is lost in cooking. As with pineapple sage, I think people expect curry plant to have more culinary power because it smells so nice. Even though curry plant isn't the flavor powerhouse promised by its complex and very compelling scent, it is still useful in the kitchen. Actually, there are a lot of uses for curry plant: Chopped fine it compliments mild dishes and ingredients like eggs, yogurt, mild cheeses and even fish. It enhances vinegar blends and makes a nice garnish, too. If you think you might like to try making an herb wreath, swag or even potpourri, curry plant will look and smell nice there as well. This useful little herb can be propagated from seed or cuttings, and the plant itself will survive for years in your landscape. It tends to get rangy and untidy after a while, though, and will become less productive after about the third or fourth year. Immature plants make unique gifts. Many gardeners are unfamiliar with curry plant and are immediately drawn to its aroma and soft, elongated, gray leaves. It's adorable and unusual. Curry plant makes a very nice houseplant provided you can give it plenty of sun. This plant will need supplemental light if you can't give it six to eight hours of powerful light a day. A southern exposure close to the window is ideal. I've kept a curry plant indoors for a couple of years now, putting it outside in spring and summer. As one of my commuter plants, it's refreshingly undemanding. When it spends time in my kitchen, its spicy aroma is very noticeable and nice. Even when I'm not cooking, it smells like I have something delicious going on. If you do place curry plant in a pot, make sure to add some sand to the soil for good drainage, and water it sparingly. If you'd like to expand your herb collection this year, I recommend curry plant. It's a curiosity, but a fun and useful one. The only health related caution seems to be a suggestion from some sources that it not be used by pregnant or breastfeeding women. One of the essential oils labels I looked at limited use to children six and older -- but this was for the concentrated oil. hi sara :) do you know, does trimming the the budding flowers from the tips serve any purpose? thanks! Often herb gardeners will snip buds off plants they want to keep from bolting -- or flowering prematurely. Usually when a plant begins to flower, it puts all of its energy into producing flowers and stops producing as many leaves. If you're cultivating an herb like cilantro, dill, basil or curry plant for its leaves, snipping off the emerging buds will prolong leaf production up to a few weeks -- especially in very warm weather when annuals particularly start preparing for the next step in their lifecycles, setting seed. In the case of curry plant, the flower buds might be harvested in their own right for craft applications as ingredients in vegetable dyes or potpourri. I just found this, because our local nursery had what looked like a rosemary plant - but a bit different. I bought two of them. Glad to have found info here about this plant! I think I will nose around your blog, being I'm doing raised beds this year, and I have herbs planted in the garden area at church. Thank you for the information! I personally like this little plant for it's soft, silvery leaves, and its aroma. I found this little plant at the grocery store (half dead) for 50 cents so I took it home, expecting to kill it (two years ago). It is now the biggest herb bush in my garden and smells lovely. I just didn't know what to do with it all, so this site has been helpful. I am in Kentucky (used to be zone 4 but now we are considered zone 6). I am going to attempt making curry vinegar and maybe oil. I might just cut it for a wreath. It is one of my favorites because it has survived my haphazard gardening style! Over here in Andalucía, Southern Spain, this little plant grows wild, all over the place in the thin, but clay, soils. A local told me it is called Mantequilla de la tierra, Butter of the soil/earth because of the yellow flowers which are used to make a strengthening herbal tea - I have no idea what, if anything, it contains. I have looked on http://www.pfaf.org/user/Plant.aspx?LatinName=Helichrysum+italicum, my favourite info site but no luck there either. Of course here is its natural range so there is no need for greenhouses etc. Anywhere with a Mediterranean climate should be the same, e.g. California. Over here in Andalucía this plant grows wild as it is in its natural range. A local man told me it is called here, mantequilla de la tierra, butter of the earth, for its yellow flowers. These are all they use here making a strengthening herbal tea. I have no idea what, if anything, this tea contains and have yet to try it. The soils here a thin but a clay derived from the conglomerate rocks of the local mountains, so full of nutrients. There is rain in winter (except this year!) but none from March to October so it withstands drought very well. I've been growing it in our heavy Dutch clay soil for years (sunny position). I came across it in a cabbage stir-fry in Turkey and couldn't get enough! Choose your cabbage leaf of preference, I like kale, finely chop a mild onion, crush 1 clove of garlic gently fry till almost golden, now add 5 sprigs of curry leaves and the Kale and toss till the kale is ready to eat. Yum with grilled meat on the side.